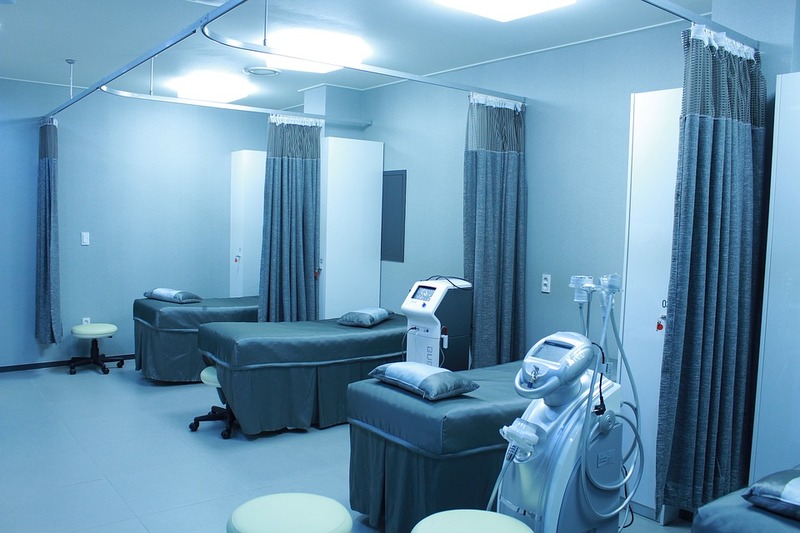 Sciblogs | Why are some preventable cancer deaths in Māori and Pacific peoples increasing? Why are some preventable cancer deaths in Māori and Pacific peoples increasing? Work we just published shows some adverse trends in cancer deaths by ethnic group, as well as some favourable trends. In this blog we discuss some of the key findings of this research and what the options are for NZ society to address the harmful trends for obesity-related cancers, tobacco-related cancers and infection-related cancers. We have just published an update on cancer mortality inequalities, from the New Zealand Census Mortality Study (NZCMS) and CancerTrends, in the journal BMC Cancer. The results show a changing pattern of ethnic inequalities in cancer in New Zealand.1 For every 100,000 people who identified as Māori, from 2006-11 there were more than 100 ‘excess’ cancer deaths each year that did not occur among the European/Other population. This accounts for around a total of 600 deaths per year in New Zealand and is greater than in 1981-84 when this figure was 72 excess cancer deaths per 100,000. In 2006-11, Māori men and women were 1.91 and 2.18 times more likely to die from cancer than European/Other respectively. Pacific men and women were 1.32 and 1.46 times more likely to die from cancer than European/Other. Absolute inequalities in excess cancer deaths (standardised rate differences; i.e. the gap between the lines in the Figure above) in Māori and Pacific peoples relative to European/Other increased in the 1980s and 1990s and continued to increase in Pacific women in the 2000s. The reason for increasing excess deaths for Māori and Pacific is steady falls in mortality for European/Other, and stasis or even increases (e.g. 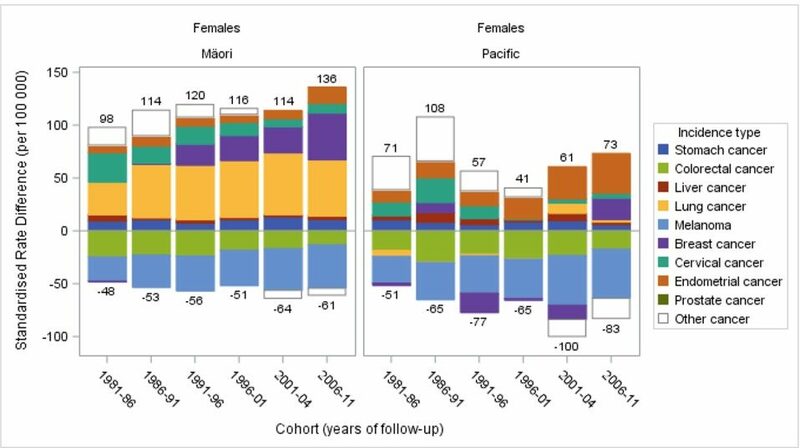 Māori females) in Māori and Pacific mortality (Fig. 1). However, the trends in these inequalities varied by cancer type. The good news is that cervical cancer incidence inequalities declined (based on cancer registrations). Also lung cancer rates appear to have peaked and are now falling in Māori men and women. The bad news is that absolute inequalities in breast, prostate and colorectal cancer mortality continued to increase. Excess breast, colorectal, endometrial and liver cancer incidence also continued to increase. The most striking aspect of this new research is the major increases in inequalities for the obesity-related cancers. 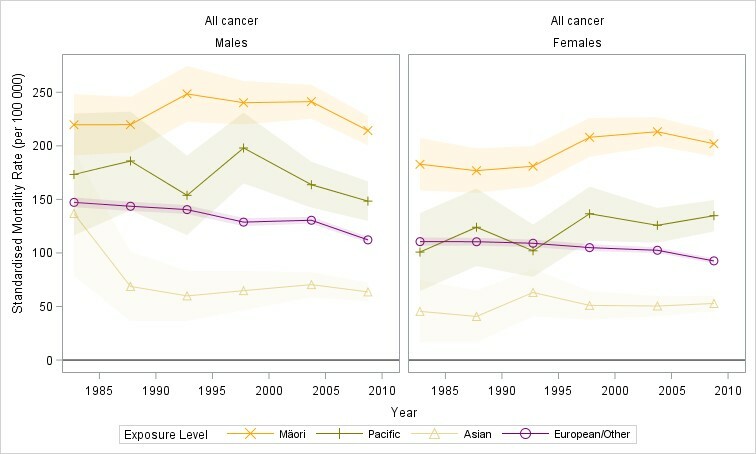 This is clearly evident in Māori and Pacific women in Fig 2, which shows increasing contribution to inequalities in cancer incidence from breast cancer and endometrial cancer over time. These results are a sentinel warning about the future of ethnic inequalities in cancer deaths. 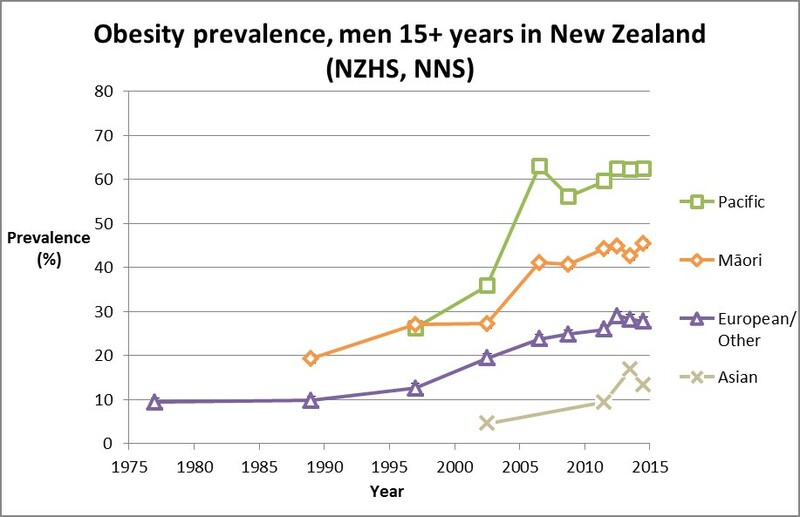 Not only are rates of obesity high in New Zealand they are increasingly socially patterned (Fig 3). The obesogenic environment in New Zealand urgently needs to be addressed so that all New Zealanders benefit but that Māori and Pacific peoples particularly benefit. This requires widespread policy changes, including physical activity options (for walking and cycling), providing healthy school lunches, constraining junk food marketing and limiting junk food outlets – particularly in deprived areas. This study reiterates that tobacco is the major single contributor to ethnic inequalities in cancer in New Zealand. Lung cancer remained the major contributor to absolute inequalities in Māori (50% and 44% of excess cancer deaths in men and women). Lung cancer inequalities appeared to have peaked, however they still account for 50 additional deaths per 100,000 Māori men and women every year. 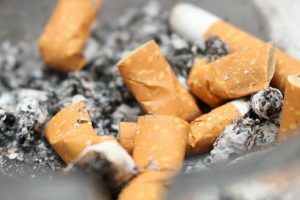 These findings are driven by the phasing of the tobacco epidemic and trends in smoking from approximately 30 years ago. Of concern for future inequalities, is that smoking prevalence remains twice as common among Māori men and three times as common in Māori women as European/Other. Māori smoking prevalence must be addressed for future inequality improvements and to maximise the probability of reaching the Government’s 2025 Smokefree Goal. Dramatic reductions in smoking prevalence, and reductions in the absolute gap in rates between Māori and non-Māori, would translate into sizable reductions in cancer mortality inequalities (on an absolute scale at least). Tobacco eradication is thus a high priority – whilst also addressing the developing obesity epidemic. Infection-related cancers make a significant contribution to excess deaths in Māori and Pacific peoples. Stomach cancer was the third most important contributor only after lung and breast cancer mortality, and accounted for some of the highest relative inequalities between Māori/Pacific and European/Other. A vast number of stomach cancer cases (89% of non-cardia stomach cancer (2)) are the result of chronic H. pylori infection. H. pylori is directly related to childhood poverty and household crowding (3). The infection is usually acquired in childhood and Māori and Pacific have 1.9 and 3.4 times greater prevalence of H. pylori infection (and even greater relative differences in younger cohorts) (4). Stomach cancer inequalities can be addressed. Trials of testing and treating H. pylori infection in asymptomatic individuals (not done in NZ) show a 33% reduction in stomach cancer. A national approach such as a population screening programme is likely to be cost-effective (5) and may be worthwhile for addressing high and disparate rates of H. pylori infection in the adult population. A comprehensive approach would also prevent the acquisition of H. pylori in the first instance by addressing household crowding and improving living conditions for children. Ethnic inequalities in cancer are preventable and trends in these inequalities are largely driven by the social determinants of health, flowing through to risk factors such as tobacco, obesity and infections. In this blog we have focused on just three of the largest modifiable risk factor mediators of ethnic inequalities in health. If NZ policy-makers are concerned about reducing the impact of cancer and health inequalities then they will need to take stronger measures to address disparities in obesity, tobacco use and H. pylori infection. A robust and resilient approach must also address the underlying social determinants such as child poverty, racism and culturally inappropriate services, housing affordability and income disparities. Teng AM, Atkinson J, Disney G, et al. Ethnic inequalities in cancer incidence and mortality: census-linked cohort studies with 87 million years of person-time follow-up. BMC Cancer 2016; 16(1): 755. Plummer M, Franceschi S, Vignat J, Forman D, de Martel C. Global burden of gastric cancer attributable to Helicobacter pylori. International Journal of Cancer 2015; 136(2): 487-90. Baker MG, McDonald AM, Zhang J, Howden-Chapman P. Infectious Diseases Attributable to Household Crowding in New Zealand: A Systematic Review and Burden of Disease Estimate. In: He Kainga Oranga / Housing and Health Research Programme, editor. Wellington: University of Otago / Ministry of Health; 2013. McDonald AM, Sarfati D, Baker MG, Blakely T. Trends in Helicobacter pylori infection among Maori, Pacific, and European Birth cohorts in New Zealand. Helicobacter 2015; 20(2): 139-45. Teng AM, Kvizhinadze G, Nair N, McLeod M, Wilson N, Blakely T. Cost-effectiveness of Screening for H. pylori infection in a high risk population. (Under Post-Revision Review by a Journal).